William, when did you first start riding bikes? When I was around five or six. 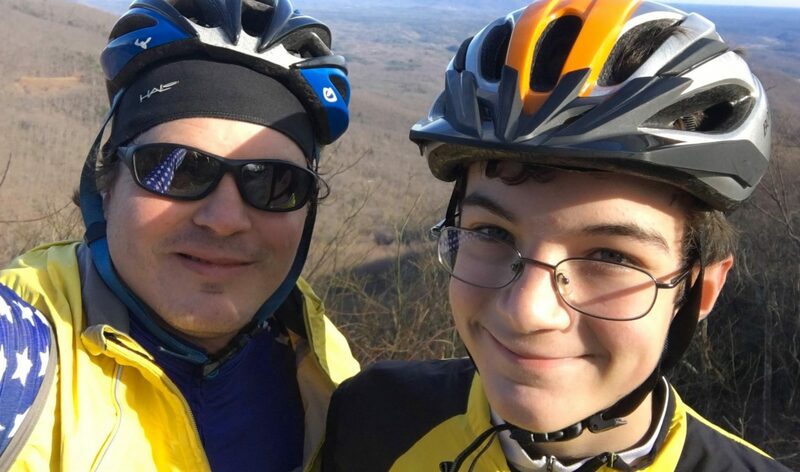 My Dad and I started out going up and down my street, then started heading down to our local rail-trail. It’s around 15-20 miles long… my dad used to take me on a tag-a-long tandem, then I started riding with him on my own. There’s a good ice cream and coffee shop downtown that we ride to, sometimes. Does your whole family ride? My mom doesn’t really like bikes all that much, so most of the riding is done by me, my sister, and my dad. We’ve done some charity rides together… sometimes my sister is kind of slow. My dad bought a tandem bike last summer for him and her to ride on. Some nights we head down on the rail-trail together. How did you come to riding on Zwift? My dad introduced me to it when I was 8 or 9. I think it was introduced to me to train for Storming of Thunder Ridge, a 27 miler that I was the youngest to ever ride. What are your goals on Zwift? I have two. The first one, which I achieved recently, was to get to level 12 so I could do the Alpe du Zwift. (This goal was set by my dad. He says the Alpe is a good training ground for doing the 75 miler I’m riding in May.) The other goal (set by me) is to get the Tron bike. I hear you’ve got a couple of big IRL rides you’re doing this year. Please tell us about them! 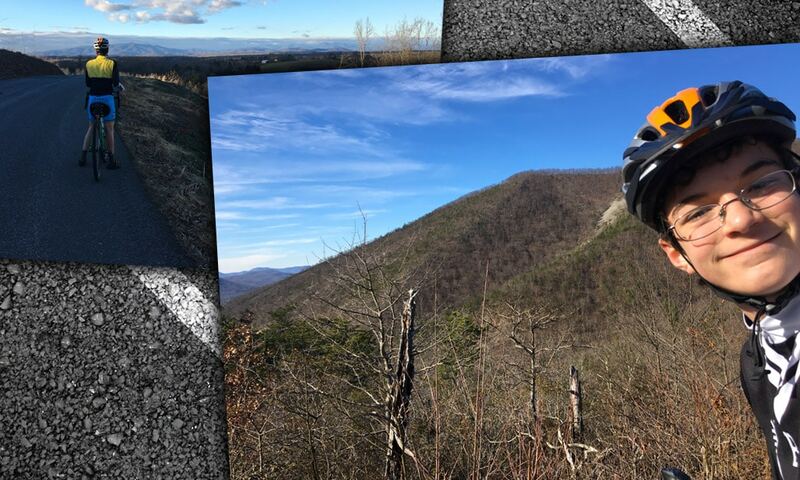 This spring, I’m doing a 75 miler called Storming Of Thunder Ridge. In previous years I’ve done the 27 and 45-mile options (I added mileage onto the 45 miler to make a 50 miler for a Boy Scouts merit badge) and my dad likes my sister and I to push for higher and harder miles. This summer I’m going to be doing a Boy Scout 3 or 4-day bike camping ride from Pittsburgh to Cumberland, Maryland on the Great Alleghany Passage (GAP). We’ll be hauling our own camping gear on our bikes. Both of these rides will be hilly and will probably have a mountain or two on them. This last summer my Boy Scout Troop did a 2-day bike camping trip from Williamsburg to Richmond. That was a lot of fun, but it was really flat. When you’re not Zwifting what do you like to do? I like to read, eat, sleep, draw, and mostly stuff ordinary 7th graders like to do. What do you like to listen to while Zwifting? I’m not really particular about what I listen to. 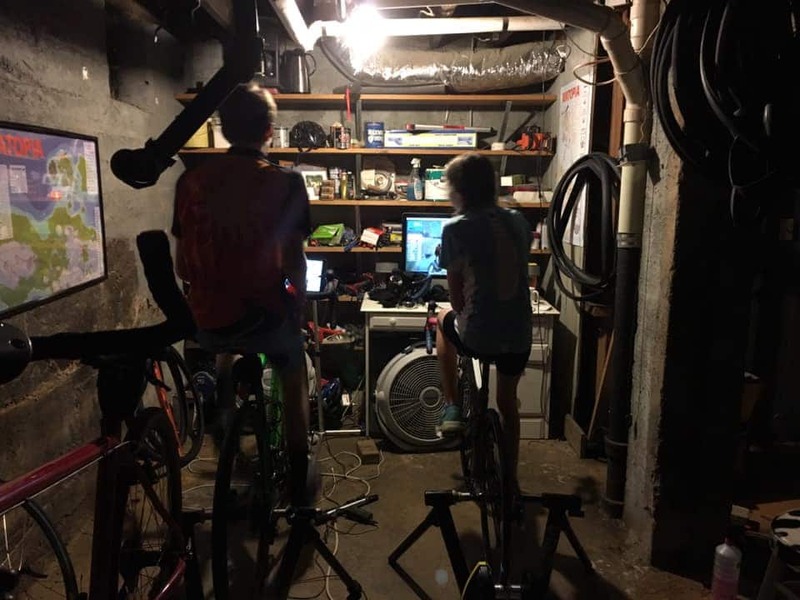 My dad and I ride together in the basement. He usually turns up some Muse, the Tron Legacy Soundtrack, or one of a couple of mixes that he has. Sometimes we talk while we ride. I have a Cycle-Ops Magneto dumb trainer paired up to an Ipad. My bike is a Diamondback Haanjo gravel bike with some Wahoo sensors on it. What’s your favorite thing about Zwift? I like that Zwift feels realistic. What would you like to see them add into the game? I’d like to see them add paddle boats and bike pedal airplanes. Is there anything else about yourself that you’d like to share? My dad got me my own Zwift account a couple of years ago. Zwift does kid accounts for free, which is nice. I like to ride with my dad in the basement. We turn the music up a little and usually ride for 45-60 minutes. We also do some other stuff— sit-ups, calf raises, and some stuff with weights. My dad told me that if I train with him all winter that I’ll be surprised what I can pull off with the school track team in the spring. That, and I’ve got the other rides to keep in my head when I ride. Thanks to William (and his parents) for sharing his experience! William is now at level 13 and well on his way to the Tron bike at 30%! And bike pedal airplanes? What a great idea! Maybe that could even be the way we switch Zwift worlds someday! Did you know kids under the age of 16 get a free account on Zwift? Find out how to get one here, and be sure to read the important tips on Best Practices at the bottom of the article. Sign them up and get them racing today! They could be the next Greg Leo! Paddle boats and bike powered aircraft!! Why have I never thought of this. Awesome .I feel like I’ve missed out on a whole coin operated genre now too!! Great job William. I’m thinking of coming to the Storming of Thunder Ridge myself. I’m a few decades older than you so you’d probably zoom by me. I’m enjoying this great winter we are having in Virginia by spending time in Zwift.